It looks like this is going to be a VE Schwab January. A Gathering of Shadows is the second of her books that I’ve previewed here, and I’m pretty sure I’ll be able to get to the third one by the end of the month (spoiler alert: I’m actually writing these in December and scheduling them way ahead of time, because one of my resolutions is to actually get this blog back up and running smoothly again). One of the worst decisions I’ve ever made is bringing a book to read during my lunch hour at work. Thankfully, my new job gives me an entire hour for lunch (much better than the paltry thirty minutes at my previous jobs), because otherwise I don’t know if I’d be able to handle this book in just short bursts. This book is already head-over-heels better than the first installment, and I’m only a few chapters into it. It’s like, are you kidding me? How on earth have I let these books pass me by over the years? I was so excited about the first book, and thought that there was no way the second one could top it. I was dead wrong. I’m pretty sure I’m looking at another 4-5 star book, but of course, only time will tell. 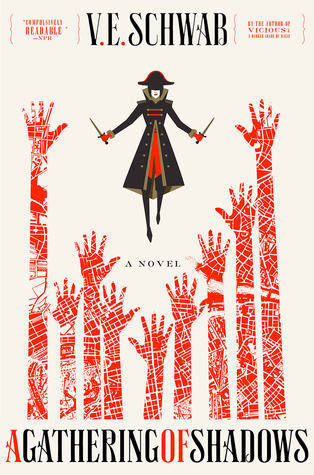 Posted on January 11, 2019 December 28, 2018 by Lauren @ BAOTBPosted in First Impression FridaysTagged a gathering of shadows, book, books, fantasy, First Impression Friday, First Impression Fridays, magical realism, reading, ve schwab.